With the exception of the six months I spent living by the sea in the west of Ireland, I have always been a mountain girl. It took me to adulthood to realize (like so many other things) that I need to be within sight or, better yet, touch of tall mountains to maintain my emotional wellbeing. But that half a year I spent wandering the small, quiet beach in a small, quiet Connemara town, plus a week at the beach each summer of my childhood, have also inspired a love of and reverence for the ocean. And so it was a joy to explore the beaches of my childhood with my own children last week, at the summer mecca that is Cape Cod. Here, the beaches teem with sun seekers and sand lovers. The roads to the beach are many and filled with cars. Ice cream shops, pizza parlors and seafood restaurants, and stores hawking all nature of small colorful rafts and plastic knickknacks pop up regularly. Cedar shingled houses fill postage stamp lots everywhere. This is not the sea of the West of Ireland, with its beaches nearly empty of people, dolphins leaping through the dark water off the shore, and solitary fishermen rowing long curraghs out to check lobster pots – the idyllic and useful sea that tugs at my soul. But on Cape Cod, amid all the hubbub, are the beaches of my childhood, when my family would spend a week at a friend’s house, walking down the sandy lane and ducking through a hedge of beach roses to reach the nearest swath of shore. The return to the Cape, after a long absence and with my own children, was a replay of memories and the making of new ones, with new characters and changed roles. The parents of 30 years ago are now happy grandparents, holding on to the small hands of new swimmers. The carefree child of that time now the watchful mother, orchestrating lunch on the beach and sandcastle construction. The delight of children at the beach – skipping through waves, scooping handfuls of shells into bright buckets, chasing seagulls – is the same, though the faces have changed. 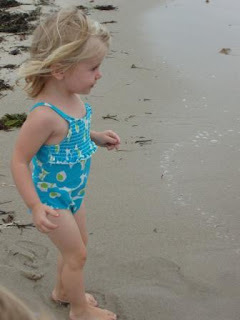 My children basked in a week of tiptoeing through seaweed and discovering hermit crabs and horseshoe crabs and sand crabs, returning to our cottage each afternoon with sand in their bathing suits and hair, the salty-thick air of the shore clinging to skin and filling noses. They played mini golf, nudging turquoise and yellow and fuchsia balls through tiny lighthouse doors and under windmills. They spit out the salt water of the sea when waves trespassed too far and savored the sweetness of ice cream at a place called Sundae School, my own childhood haunt. They took boat rides with old friends to quiet beaches that disappear when the tide rises and looked for lighthouses rising from rocky outcrops. A Cape Cod friend gave my mother a card that reads “Once you get Cape Cod sand in your shoes, you will always return.” We have come home to our mountains, inadvertently and inevitably carrying Cape sand in our shoes, the car, our bags. Along with the sand, my children have carried home buckets of seashells from the seashore, picking up each newly discovered shell as if it is the most wonderful, most beautiful, most unique of all the millions gathered in long piles on the beach. I hope they also carry in their hearts good memories of the sea and all the joys of childhood summers at the ocean. In honor of Saturday's running of the 19th annual Top Notch Triathlon, I'm posting an article I wrote for the Courier back in 2002 (or 2003?) about my own second Top Notch experience. I believe the headline with this front page gem was: Surrounded by Men in Spandex, Our Reporter Makes it to the Top. ﻿﻿ We came up with the inane idea in February, during a late night discussion, after a consuming a few beers. Summer seemed distant then, a world away. The three of us would be training partners for the Top Notch Triathlon, six months down the road. We'd have weekly training sessions. We'd ride our bikes hard, swim in Echo Lake's icy waters, practice scrambling quickly up mountains. I'd finished the "Race to the Face" as an Iron woman once during my college years. My mother has a picture of me at the finish that day. I look only slightly tired and out of breath. I look happy. It would be fun. By the time July hit, we'd conceded to compete as a team. Carrie couldn't get the day off from managing the Echo Lake Park, but she could do the swim. 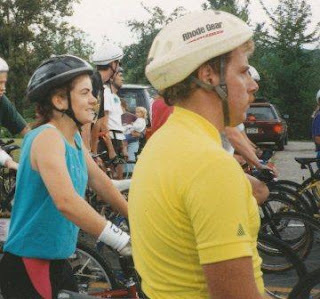 Nicole hadn't recovered completely from a winter knee injury, but she could do the mountain bike portion. That left me with the questionable honor of running the final leg, a 2.5-mile jaunt up Cannon Mountain. I felt relatively fit from riding my new road bike all summer. I hadn't done much hiking or been running in months, but I figured, "What the heck, it's only two and a half miles." Well, about a third of the way up the mountain last Saturday, I wondered what on earth had inspired me to put myself through this ordeal. It was hot. It was steep. I was surrounded by men in spandex, and they were passing me left and right. My legs ached. My lungs burned. I though surely I would finish last, or collapse somewhere along the way. I've spent a lot of time on Cannon Mountain. I like it a lot better when it's covered in snow and I've got skis strapped to my feet. Most of the way I was in a pack of competitors strung along in a winding, panting queue creeping up the mountain's ski trails. When we reached the Tramway trail, folks passing overhead shouted encouragement from the open windows of the tramcars. I was extremely envious of their free ride. As I finally approached the finish, I spotted my teammate Nicole waiting for me. She had finished her biking leg nearly an hour earlier, had gone for a swim to cool off, changed clothes. She looked refreshed. She cheered me on, and I actually found the strength to run through the finish. All I wanted to do was sit down in a shady spot, drink some water, catch the breath I'd lost 40 minutes ago. As I came through the finish my friend Tim, the race director, yelled encouragement. I figured that whatever I'd been through in the last 40 minutes was pretty miniscule considering the cancer treatments he'd endured all winter and into spring. I was glad to see him there cheering us on. A few minutes later, as we looked out at the blue sky surrounding the magnificent mountain named Lafayette, Nicole said, "Wow, that was really fun." Fun? Well, I guess after the fact, yeah, it was fun in some strange, competitive sense. And we managed to finish second out of the women's teams. We're already discussing our strategy for next year's race. The team who beat us was the "Go girls." We figure next year we'll train a little harder. I may actually go for a few trail runs or hikes before the race. We're thinking about calling ourselves the "Go faster girls."